Google and its parent company Alphabet are starting to address some ethical concerns raised by the development of artificial intelligence (AI) and machine learning, but, as yet, have not taken a position on the unchecked use of autonomy and AI in weapon systems. These and other technology companies such as Amazon, Microsoft, and Oracle, should publicly endorse the call to ban fully autonomous weapons and commit to never help develop these weapons. Doing so would support the rapidly-expanding international effort to ensure the decision to take human life is never delegated to a machine in warfare or in policing and other circumstances. On 14 May, more than 800 scholars, academics, and researchers who study, teach about, and develop information technology released a statement in solidarity with the Google employees that calls on the companies to support an international treaty to prohibit autonomous weapon systems and commit not to use the personal data that the company collects for military purposes. Previously, in a 12 March letter to the heads of Google and Alphabet, the Campaign to Stop Killer Robots recommended the companies adopt “a proactive public policy” by committing to never engage in work aimed at the development and acquisition of fully autonomous weapons systems, also known as lethal autonomous weapons systems, and publicly support the call to for a ban. Project Maven raises ethical and other questions about the appropriate use of machine learning and artificial intelligence (AI) for military purposes. The Campaign to Stop Killer Robots is concerned that the AI-driven identification of objects could quickly blur or move into AI-driven identification of ‘targets’ as a basis for the direction of lethal force. This could give machines the capacity to make a determination about what is a target, which would be an unacceptably broad use of the technology. That’s why the campaign is working to retain meaningful human control of the critical functions of identifying, selecting and engaging targets. In July 2015, high-profile Google employees including research director Peter Norvig, scholar Geoffrey Hinton, and AI chief Jeff Dean co-signed an open letter endorsed by thousands of AI experts that outlined the dangers posed by lethal autonomous weapons systems and called for a new treaty to ban the weapons. Last month, Amazon’s Jeff Bezos expressed concern at the possible development of fully autonomous weapons, which he described as “genuinely scary,” and proposed a multilateral treaty to regulate them. The Campaign to Stop Killer Robots welcomes these remarks and encourages Amazon to endorse the call for a new treaty to prohibit fully autonomous weapons and pledge not to contribute to the development of these weapons, as Clearpath Robotics and others have done. Issuing ethical principles means little if a company fails to act on fundamental challenges raised by military applications of autonomy and AI. Responsible companies should take seriously and publicly support the increasing calls for states to urgently negotiate a new treaty to prohibit fully autonomous weapons. 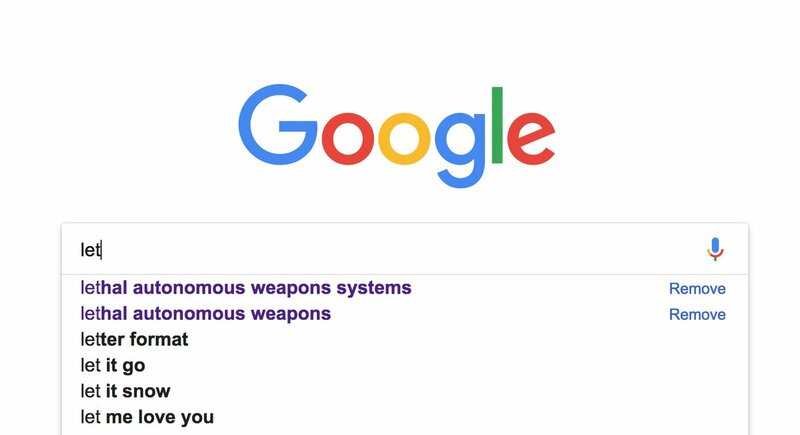 UPDATE: On 7 June, Google released its ethical principles, including a pledge not to develop artificial intelligence for use in weapons. Google staff forwarded the principles on to the campaign coordinator and sent thanks for the input provided. The release followed the news reported by Gizmodo on 1 June that Google has decided to end its participating in theProject Maven contract expires next year. Campaign to Stop Killer Robots letters to Google and Alphabet (12 March) and Amazon (16 May).